Selection of right immigration program is the biggest worry of the visa applicants planning overseas immigration. The applicants are most often not aware about the relevant programs based on their profile. This leads to endless wait for the invitation to apply or rejection of the profile. Canada and Australia both countries have some set selection factors to select the skilled workers from overseas and subsequently, allocate them permanent residency. What are the Key Selection factors of Canada and Australia immigration? Canada and Australia immigration system have many things in common, i.e. point-based immigration system, permanent residency process, and of course the key selection factors, based on which they allocate points to the visa applicants. Here are the common selection factors of Canada and Australia. Both the countries allocate points to the applicants based on the age factor. The applicants between age group18-35 get maximum points for the age factor. Needless to mention that when you are applying for the skilled visa, you need to demonstrate relevant work experience. English is the official language of both Canada and Australia. Hence, competent English language skills is the demand of both country’s immigration department. Canada also accepts French language proficiency. Employment offer, adaptability and nomination from province or state are also the selection factors employed. As an applicant, you get points for each of the above factors. In case of Canada’s express entry system, you need a minimum 67 points to qualify. On the other hand, Australia need a minimum 65 points out of 100. Visas Avenue is the leading and registered Visa and Immigration Consultancy in India that specializes in Canada and Australia immigration. Whenever an applicant reaches to Visas Avenue, the qualified and vastly experienced Client Service Managers, assess the profile of an applicant to suggest him/her the best program to apply. It has been observed several times that the applicants not able to get the invitation to apply himself and then reaches Visas Avenue for assistance. The VA team assess the profile of such applicants and subsequently, guides them the best way about available immigration programs and their chances of getting selected for the same. If you have plans to move to Canada and Australia in the months to come, you must get in touch with registered immigration experts and professionals at Visas Avenue to prepare your file for the most appropriate visa program and improve your chances of obtaining visa this year. 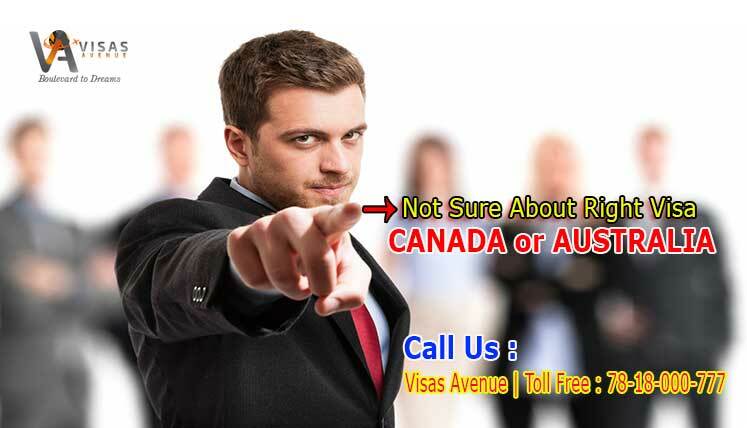 You may call Visas Avenue immigration experts on Toll-Free Number- 78-18-000-777. Alternatively, e-mail your queries to Visas Avenue e-mail id- info@visasavenue.com. You may also fill and submit the free assessment form and get the assessment result on your e-mail id. What Makes Saskatchewan the Easiest Canadian province to get permanent residency?